interpreted as anatase,2 despite the fact that the crystal structure of these nanotubes is known to be more sophisticated. Based on XRD, SAED and HRTEM data, Peng et al.3,4 proposed that the crystal structure of titanate nanotubes corresponded to the layered trititanic acid (H2Ti3O7) having a monoclinic crystal structure (see Table 3.1). A schematic showing the crystal structure of monoclinic trititanic acid in a TiO6 edge-sharing octahedron representation is shown in Figure 3.1. 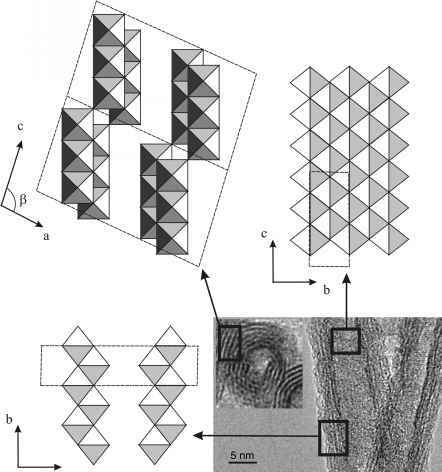 The three different projections of the crystal structure corresponding to crystallographic axes are linked to particular areas in HRTEM image of the nanotube, showing how the packaging of layers in the crystal is related to the fringes in the microscope image. A nanotubular morphology of layered trititanic acid can be obtained by rolling several (100) planes around axis  (ref. 3) such that the axis of the nanotube is parallel to the axis b of monoclinic H2Ti3O7. The radial direction from the tube centre towards the walls corresponds to axis a of trititanic acid, and the tangential direction to the nanotube surface corresponds to axis c.
Recently, Wu et al.5 have proposed that rolling of the (100) plane could occur around axis [ 001]. In both cases, the walls of the nanotubes consist of several layers, typically separated by 0.72 nm. The structure of each layer corresponds to the structure of the (100) plane of monoclinic titanates, which is a set of closely packed TiO6, edge-sharing octahedra (see Figure 3.1). 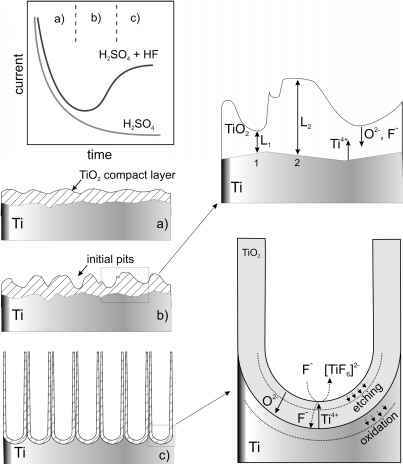 Using XRD and TEM data, Nakahira et al.6 characterized a TiO2 nanotube sample produced by alkaline hydrothermal treatment, as a tetratitanic acid (H2Ti4O9 • H2O). The presented XRD spectra, however, have very broad reflections which have similar positions to those of trititanic acid. The crystal structure of tetratitanic acid is similar to trititanic acid, the former having four-edge sharing octahedra in the unit cell, rather than the three-edge sharing octahedra of the latter. 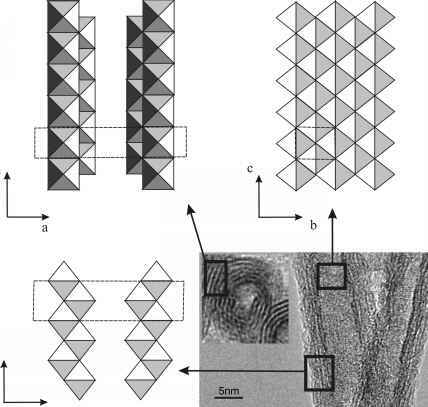 Based on studies of the sodium content of titanate nanotubes at various pH values during acid washing (in combination with XRD and TEM data), Jin et al.7 proposed a crystal structure for titanate nanotubes as H2Ti2O4(OH)2 with an orthorhombic unit cell. Both protons of the bititanic acid could be ion-exchanged with sodium ions. The XRD pattern shows similar reflections to the monoclinic trititanic acid (see Table 3.1). The orthorhombic dititanic acid also has a layered structure of walls, where each layer represents the (100) plane rolled around the b axis. The (100) plane is built up from edge-sharing TiO6 octahedra, forming a zigzag structure (see Figure 3.2). After scrolling of nanosheets into nanotubes, the radial direction from the tube centre towards the walls of the tube corresponds to axis a of orthorhombic dititanic acid, and the tangential direction to the nanotube surface corresponds to axis c. The axis of the nanotubes is parallel to axis b, similar to that of trititanic acid. Table 3.1 Comparison of the crystal structures of layered titanates. Figure 3.1 Crystal structure of trititanic acid (H2Ti3O7) in three different projections, in octahedral presentation and a HRTEM image of titanate nanotubes. The solid rectangles in the HRTEM image show the areas corresponding to particular projections. The dashed lines show the dimensions of the unit cell. Hydrogen atoms are not shown, for clarity. a, b and c are crystallo-graphic axes, and b is the monoclinic angle. hypothesis.10 Unlike trititanic acid, which has three steps of corrugated layers, the lepidocrocite titanate and orthorhombic dititanate consist of a continuous and planar two-dimensional array built up from TiO6 edge-sharing octahedral similar to dititanic acid (see Figure 3.2), with the exception that axes a and b are swapped. Thus the radial direction from the tube centre towards the walls of the tube corresponds to axis b of lepidocrocite-type titanic acid. Figure 3.2 Crystal structure of titanic acid (H2Ti2O4(OH)2) in three different projections, shown in octahedral presentation and a HRTEM image of tita-nate nanotubes. Solid rectangles in the HRTEM image show the areas corresponding to particular projections. The dashed lines show the dimensions of unit cell. Atoms of hydrogen are not shown for clarity. a, b and c are crystallographic axes. Another difference between monoclinic tri- or tetra-titanates and orthor-hombic titanates is that after scrolling, the nanotube surface is corrugated in the first instances and smooth in the latter. The STM and AFM images reported elsewhere11 showed the steps in the nanotube wall with their edges parallel to the tube axis supporting a monoclinic crystal structure of the nanotubes. Figure 3.3 Crystal structure of monoclinic TiO2-(B) in three different projections, in octahedral presentation and a HRTEM image of titanate nanotubes. The solid rectangles in the HRTEM image show the areas corresponding to particular projections. The dashed lines show the dimensions of a unit cell. Atoms of hydrogen are not shown for clarity. a, b and c are crystallo-graphic axes, and b is the monoclinic angle. 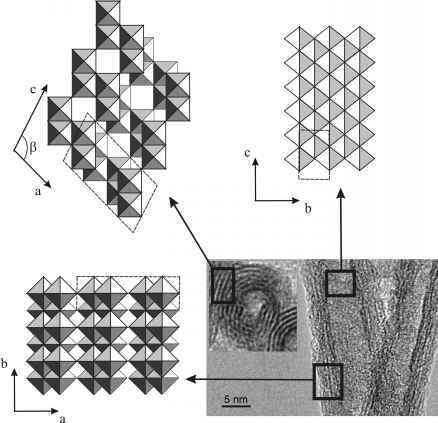 octahedra, forming a structure with channels in which transport and exchange of small cations can occur (see Figure 3.3). crystals, however, is slightly different from that of TiO2 nanotubes, especially at small 20 values (see Table 3.1). As our understanding of the exact structure of titanate nanotubes continues to evolve, it is common to see both 'titanate nanotubes' and 'TiO2 nanotubes' used as terms to describe these materials. A recent analysis of pre-edge structure in (Ti K-edge) X-ray absorption near edge structure (XANES) spectra of titanate nanotubes demonstrated that almost 40% of Ti atoms are uncoordinated rather than occupying symmetrical octahedral positions.15 These uncoordinated centres are located on both surfaces of the nanotubes, as well as between the layers inside the nanotube walls.